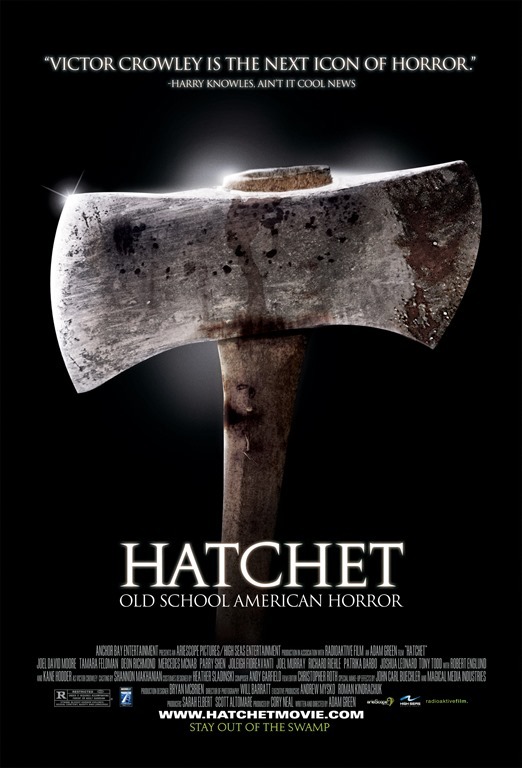 A couple of nights ago I re-watched Hatchet (2006) and Hatchet II (2010) after seeing a teaser for the upcoming Hatchet III. I am glad I did. Hatchet tells the story of a group of people that take a night tour of a Louisiana swamp during Mardi Gras festivities and run into the psycho-killer, Victor Crowley. Victor was born horrible disfigured and was raised in a cabin in the swamp by his father, Mr. Crowley (played by the always amazing Kane Hodder), protecting him from the cruel outside world. Local kids would come by in the hopes of catching a glimpse of the disfigured boys. One night, the local kids decide to scare him out of the cabin by throwing fireworks. Unfortunately the cabin catches fire, and in an attempt to rescue his son, he accidentally kills him. Now, years later, Victor Crowley (also played by Kane Hodder) is forced to relive that night and takes vengeance to whomever enters the swamp. So, this unlucky group of folks are on this tour of the swamp, in a portion of the swamp that has been closed for years by authorities, with an incompetent tour guide (an Asian fellow with a Louisiana accent – sometimes). The tour guide does a great job getting them hung up and thereby forcing them to get off the boat and onto land… and into Victor Crowley’s lands. One by one they are picked off in different but equally horrific ways. We also learn a bit more about each of the tourists, though at this point it doesn’t matter as they are going to die soon. We do learn that one of the people, an attractive young lady by the name of Marybeth (played by Tamara Feldman) is acually a local and along for the ride in hopes to find out what happened to her Father and Brother who disappeared a day earlier while ‘gator hunting in the same section of swamp. Like most of these movies, we see the characters taken down one at a time in great gory scenes. The movie isn’t the greatest, but it is a good slasher flick. If you like this style of film then I think You’d like Hatchet. Hatchet II continues from the very last scene of the first movie. Marybeth’s character now being played by Danielle Harris. Kane Hodder returns as Both Victor and Thomas Crowley. Part two is a story of a hunt for Victor Crowley, pushed for by Marybeth, but organized by Reverend Voodoo (a role reprised from the first movie and played by Tony Todd). Marybeth wants to retrieve the bodies of her brother and father, while Reverend Voodoo wants to clear the swamp of Victor Crowley so he can run more tours out of the swamp and make a bigger profit. Voodoo gets together a posse to defeat Crowley and they head out. Of course it’s not that easy and one by one the hunters become the hunted. We see more, gory killings as the posse’s numbers dwindle. Crowley seems unstoppable. Soon we learn Voodoo’s true plan (but I won’t tell you what it is as you can watch the damned movie yourself), and we learn just how much a douche he really is. Plans are great, but they rarely work out in movies, right? 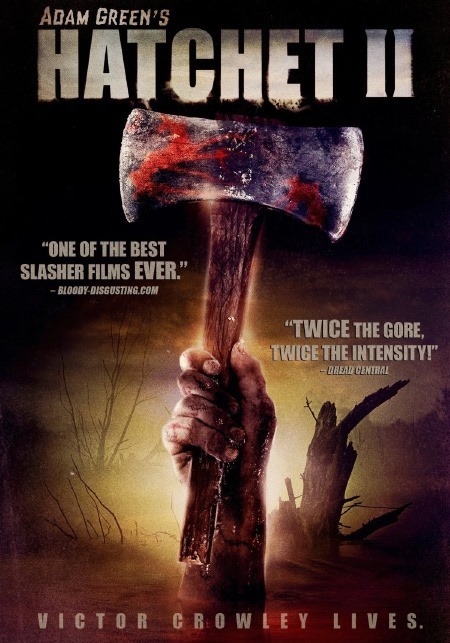 Hatchet 2 is fun, but not as good as the first, though I do suggest watching both. This entry was posted on April 3, 2013 by catfishman. It was filed under 1980's, b movies, bad, crazy, death, drive in, entertaining, entertainment, evil, film, good, horror, killers, movies, murder, original, slasher, supernatural, trailers, watch and was tagged with 1980s, Adam Green, awesome, B Movies, bad, cool, crazy, death, drive in, entertaining, entertainment, evil, film, funny, good, hatchet, horror, Kane Hodder, killers, movies, murder, original, slasher, supernatural, trailers, watch.